Book fairs and sales are regularly done to make our books more accessible to the general public. Through our selling booths, people can buy books for personal use or for charity. For schools, this is Biyaheng Eskuwela ng Adarna (BEA), our literary campus tour, which includes student contests, author and illustrator visits, and book-making lectures. Ilang linggo matapos ang pasukan, simple lang naman ang gustong gawin ni Dino Soriano habang bakasyon—ang libreng makapanood ng live streaming ng laban ni Pacquiao. Kaya niya kinalikot ang mga kable ng laptop niya. Sino ba naman ang mag-aakalang hindi si Pacquiao ang mapapalabas niya sa laptop? Nagpakilala sa kaniya ang lumitaw na bata bilang Dimension Engineer Haya Project mula sa Dimension 049. Hinahanap niya ang tumakas na kaibigang si Medical Engineer Anita Project dito sa mundo, na tinatawag ni Haya na Dimension 196. Handa ba si Dino Soriano na maging Agent 001 ng Dimension 196? Inihahandog ng Adarna House ang isang bagong seryeng pang-young adult: ang Jumper Cable Chronicles ni EK Gonzales, sa salin ni Xi Zuq. Iikot ito sa mga misyong kahaharapin ng isang 16-taong gulang na mapapasabak bilang dimension agent. Lalabas sa Manila International Book Fair ang unang libro ng serye, ang Jumper Cable Chronicles: Si Santa Anita, at darating ang awtor at manunulat para pumirma ng mga libro sa aming booth sa sunod na Sabado, 3:00 NH. Samahan ninyo kaming makilala ang ating mga bagong bida sa isang patikim—narito ang unang kabanata ng libro. The Manila International Book Fair is less than a month away! For those who have never been but are interested in books of any kind, regular MIBF visitors are sure to say that this event is not to be missed. (5) Marvel at the publishers’ booth designs. At the MIBF every year, there is a contest for best booth design, so publishers bring out all their bells and whistles to make their booths eye-catching and stop-worthy. One publisher’s aesthetic is sure to be different from the next, so part of the MIBF experience is marveling at the various styles of the booths. (4) Discover new books. If you want to find, and/or find out about, the new books the local publishing industry dished out this year, the MIBF is a great one-stop shop for these new reads. Apart from selling fresh-off-the-press books at big promotional discounts, local publishers usually hold mini-launches and promos for these new titles at the Fair. (3) Meet book creators. In connection with number 4, book fairs are great opportunities to meet your favorite authors and illustrators! Publishers invite their new and best-selling book creators to visit the booths and sign books for the readers. Some people even go to all five days of the Fair, bringing their old books each day to have them signed by the authors and illustrators visiting the booths. (2) Fill up with book bargains. All of the books are sold at huge discounts! Most exhibitors sell books up to 70% off their original price. Newly-launched titles will also surely be sold at introductory prices. 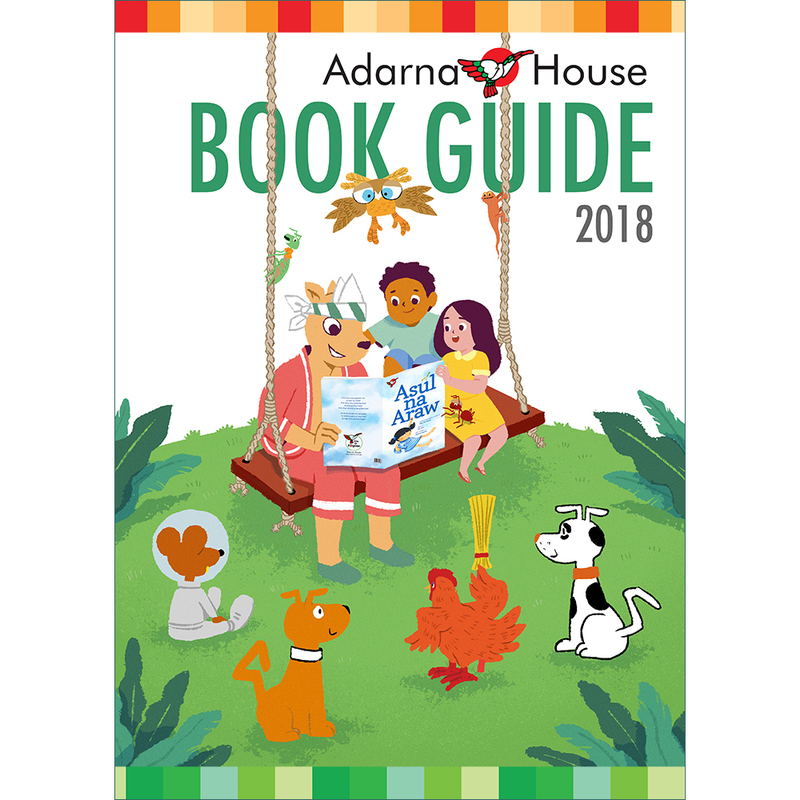 At Adarna House, you will also find bargain book bundles which are perfect as gifts if you’re ready to get an early start on your Christmas shopping. We will be posting our MIBF sale price list within this week, so make sure to pay our Facebook page a visit. (1) Support local literature. Let’s face it—the share of local books in our usual bookstore shelves is very small, which makes supporting Philippine literature a bit difficult. The great thing about MIBF is it gathers Philippine publishers in one venue, making it easy to see just what our book industry has been up to these past years. If your Filipiniana collection is in dire need of new additions, then the MIBF will do wonders for your bookshelf. The 38th MIBF is happening from September 13 to 17 (Wednesday to Sunday), 10:00AM to 8:00 PM at the SMX Convention Center in the Mall of Asia Complex in Pasay City. (Remember: the children’s and young adult section is on the 2nd floor.) Tickets are sold for PHP20 at the venue, but if you wish to skip the lines, here are free printable MIBF tickets you can present at the gate. Make sure to bring your own shopping bags, as Pasay City is a no-plastic-bag zone. And if you’re planning to buy a lot of books, you can do as the regulars do, and bring rolling luggage or strollers—you won’t regret it! 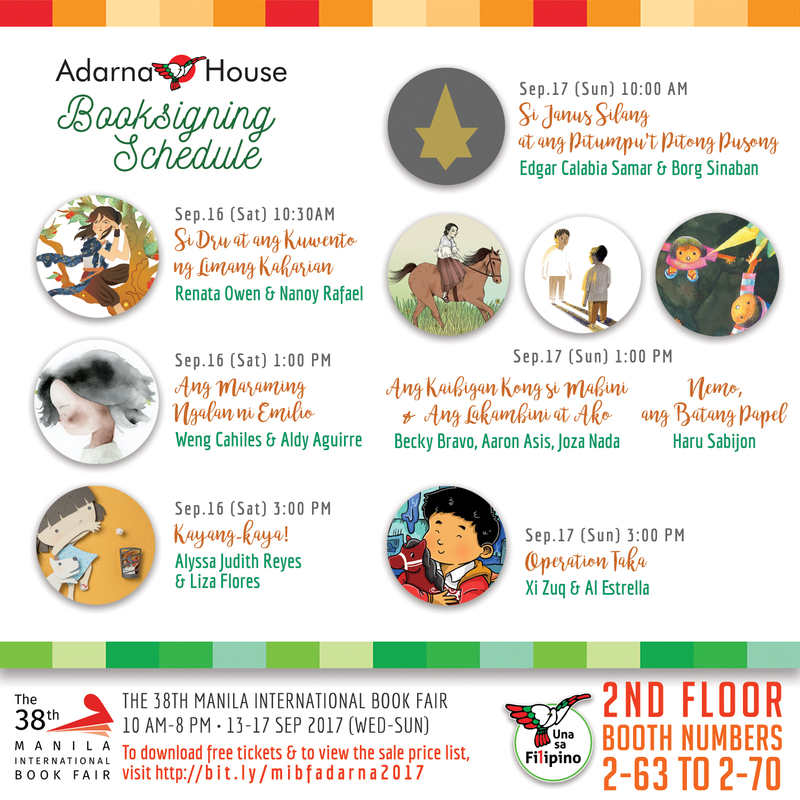 Adarna House, Ang Ilustrador ng Kabataan, and Ayala Museum invite everyone to the launch of two new board books: Kara at Play (by Lara Saguisag and Jamie Bauza) and Kapitbahay Kubo (by Pergylene Acuña)! The launch will be held at 10:00 AM on Saturday, September 24 at the Ayala Museum Ground Floor Lobby. The program will include a storytelling session, games, and prizes. We are also inviting guests with children to pre-register because the first fifty (50) pre-registered kids will each receive one of the new board books at the launch! Join National Book Store’s Philippine Readers and Writers Festival by attending our session Writing for Children, a panel discussion with the authors of our books that won this year’s National Children’s Book Awards. The discussion will be held on August 28, 2016, from 1 p.m. to 2:30 p.m., at Namayan, Raffles Makati. This session will be especially interesting because the panel will be composed of authors writing for children of different ages. Gigi Constantino‘s Dumaan si Butiki is a board book for babies and toddlers. Xi Zuq‘s Supremo is a chapter book for Grades 4-6, while Si Janus Silang at ang Tiyanak ng Tabon by Edgar Calabia Samar is the first book in a series of young adult novels. Meanwhile, moderator Ergoe Tinio wrote Salusalo para kay Kuya, a storybook for the early grades. Admission is free! This session is a part of National Book Store and Raffles Makati’s Philippine Readers and Writers Festival, three days of book signings, discussions, and panels about books, literature, and culture from top Filipino writers and artists. For more information, read National Book Store’s post about the Adarna House session.